FEATURING OUR NEW MULTIBEAM SYSTEM! 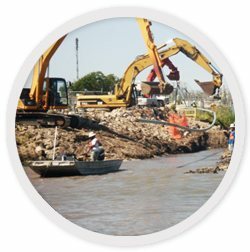 CSU utilizes systems that allow for XYZ pin point on the bottom of the waterway, useful when dealing with government dredging operations and exposed pipelines. CSU uses RTK systems combined with static data to give you true elevation and location to the earth’s surface. 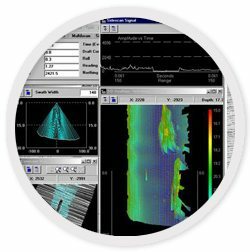 The RTK system along with side-scan sonar combined with our drafting department ensures you get the best report in a timely manner (same day in some cases!). Our new Multibeam System is an optional addition to the navigable waterway surveying giving the operator a more detailed look at the bottom of the water way. CSU has specially designed barges, dry welding caissons, and boats made for dynamic conditions to lift, lower, repair or transport pipeline in hard to reach areas. For questions or a consultation please contact Central States Underwater at 281-324-9700 or complete the short Contact Form. Pipeline Bank StablizationCSU utilizes historical data charts and flow readings to identify and map the waterway over time. With this data in conjunction with our knowledgeable staff and advanced technology, CSU has the ability to stop erosion and even move the waterway back to its original course. With over 35 year of experience throughout the United States, CSU has completed bank stabilizations that range in size from small creeks to the Mississippi river. Let us show you how to fix it the right way the first time! CSU employs the most innovative engineering staff that are able to tackle any and all projects. Jetting is a way of excavating underwater using water to push mud or sand away. Water jet probing is most proficient at identifying the depth of cover in deeper depths of water, where electronic equipment is less accurate. Emergency Response Dive Team – Mobilization within 4 Hour Notice! CSU operates a 24-7 call-out service for extra convenience and have an emergency response dive team that is able to mobilize within 4 hours notice. CSU is the leader in high current diving and flooding conditions. We have a variety of fast leak repair options, can deploy containment in any environment and assist in cleanup. Keep our number handy for your emergency situations!